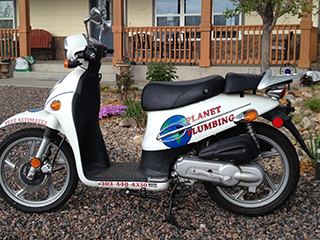 Green Plumbing Boulder: We offer plumbing services and products that are environmentally friendly for residential, commercial, and industrial customers in Boulder, Broomfield, and Weld counties. We install high efficiency plumbing fixtures such as high efficiency faucets, high efficiency showerheads, high efficiency toilets, tankless water heaters, water purification systems, and more. These all assist in meeting today’s water conservation and purity needs. These eco-friendly water delivery solutions maximize water efficiency and the life span of the products, without sacrificing any comfort and convenience for the homeowner and their families. On top of this – they can save you money on your utility and water bills! We believe that it’s our responsibility to offer Green Plumbing Solutions. We can accomplish this by helping reduce our communities’ water and electric usage, ultimately helping our customers’ and the environments’ well being with sustainable plumbing services and products. Our plumbing practices avoid using or selling any plumbing or drain chemicals, and we recycle all of our waste products. Our fleet of trucks include better gas mileage and cleaner fuel burning vehicles. We even have a scooter! We are locally owned and operated Boulder plumbing company. We make sure our Boulder customers are treated the “Boulder way” and are provided with top quality workmanship, service, and pricing. 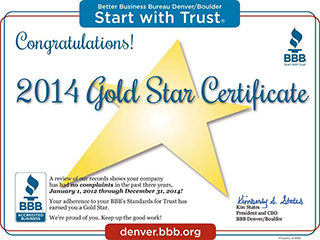 We are members of the Denver-Boulder Better Business Bureau, and have won the BBB Gold Star Award every year from 2003-2014! Everyday our objective is to please our customers, and we are always honored with the referrals and repeat business we receive from satisfied customers. 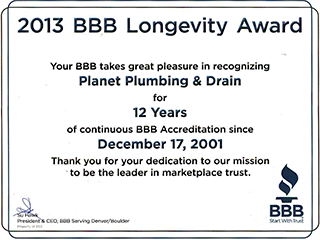 Planet Plumbing & Drain has an outstanding reputation for quality service and fair pricing with homeowners and businesses. We have been in business since 1997, and have over 20 years plumbing experience. We offer Same Day Service and whenever you have an urgent plumbing problem, we will be there to save the day. Our plumbers arrive on-time, and we will set an appointment that is convenient for your schedule. We have the latest equipment and technology, and our fleet of trucks arrive fully stocked with parts and supplies.